Popular media outlets Radio Free Asia and Voice of America have become the latest to draw the attention of the government for allegedly not paying taxes, one week after a letter to the Cambodia Daily demanding more than $6 million in back taxes was leaked. Researchers from Australia have put a dollar figure on what they are calling one of Cambodia’s most important forests in hopes of helping stave off its loss to loggers, poachers and farmers looking for new land. Singapore-based public relations agency Redhill has won the communications mandate for Dubai-founded airline Emirates in Cambodia. AirAsia launched a direct flight between Kuala Lumpur and Sihanoukville last week, increasing the coastal Cambodian city’s visibility on the international tourism radar. The Post’s Cam McGrath spoke to Spencer Lee, commercial director for AirAsia Berhad, about the new flight and the commercial decisions behind launching the route. Cambodian operator Smart Axiata and SVOD platform Iflix have signed a 3-year exclusive partnership agreement. Smart subscribers can now access regional and international TV series and films. At launch, iflix’s most popular content will be offered with Khmer subtitles, with the aim of localizing its entire catalogue in the months to come. Runner-up teams from Cambodia, India, Canada and the U.S. will receive $5,000 each. Google’s workforce needs to “represent the world in totality,” said Sundar Pichai, Google’s chief executive, at an international girls coding competition held on the company’s campus here Thursday night. The first draft of a law on surrogacy has now been completed by the Women’s Affairs Ministry, and at least seven foreign intended parents have applied to formally take their babies born through Cambodian surrogates home, a ministry official said. Hongkongers were told yesterday to prepare for the arrival next month of Cambodians to work as domestic helpers. Cambodian Prime Minister Hun Sen, who threatened Friday to use force over a border crisis with neighbouring Laos, announced Saturday that the situation had been peacefully resolved after he made a lightning trip for face-to-face talks with his Laotian counterpart. Cambodia and Laos reached an agreement for Lao soldiers to pull back from their shared border, easing the threat of a military confrontation. 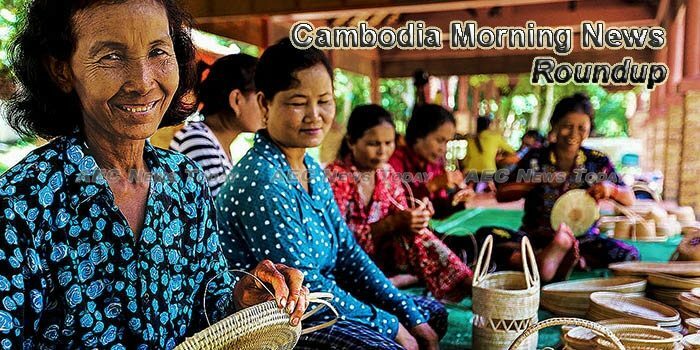 Praising Cambodia’s trade reforms, Canadian ambassador to the country Donica Pottie has urged the ASEAN nation’s government to continue with that policy to facilitate trade and investment, particularly in the garments sector. Pottie made the call while paying a courtesy visit to commerce secretary of state Ok Boung in Phnom Penh recently.